The D-Type was built for one purpose only – to win the world-renowned Le Mans 24-Hours – of which D-Types won from 1955 – 1957. The car was built around an all-new riveted aluminium-magnesium monocoque; inspired by the aviation industry and designed by Jaguar’s chief designer and accomplished aerodynamicist, Malcolm Sayer (who went on to design the E-Type). 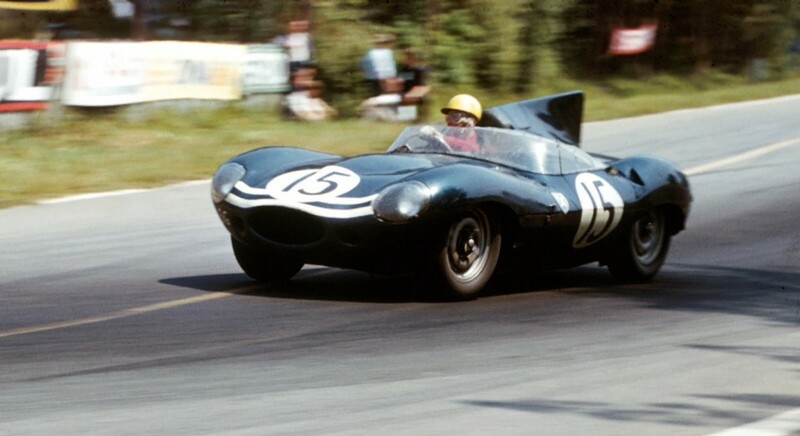 In 1955 – after the success of the D-Type’s 1,2 at the 12 Hours of Reims, the car was improved to have a stronger and lighter steel front sub-frame and the new ‘long-nose’ bodywork boasted cooling ducts at the front, lengthening the car by 7.5 inches. The ‘Works’ ‘long-nose’ D-Types, like the one pictured above – which will be in attendance at the 2015 Concours of Elegance – had a wrap-around windscreen merging into the driver’s headrest, leading to the fin in the rear. These modifications, introduced by Sayer, improved stability, downforce and gave the driver better protection. The car in question – the iconic ‘RSF 303’ was built in 1956 and driven by Mike Hawthorn at Silverstone in the same year. The following year, the car was sold to Ecurie Ecosse and collected silverware at St Etienne after coming first and second place at Le Mans.